Council of Economic Advisers Kevin Hassett said he is willing to bet, based on the economy and indicators, that there will not be a recession any time soon, even though the markets have fluctuated a great deal this year. My first observation is that Hassett’s statement regarding current growth rates surprising. Atlanta Fed GDPNow does indicate 2.9% growth SAAR in 2018Q4 (12/18), but as of 12/14 the New York Fed’s nowcast indicates 2.42% growth, while the St. Louis Fed nowcast is 2.65%. Macroeconomic Advisers today nowcasts 2.6%, latest Goldman Sachs is 2.7% (12/17). I don’t know of any nowcasts for over 3% for 2018Q4 Q/Q SAAR, although the internal CEA estimate might be for that. It’s hard to interpret the red bars, even assuming Trump remains in office for another year, because it’s possible that Trump will be removed thereafter, but before January 20, 2021. Assuming he remains in office throughout his first term, then the probability of a recession over the approximate next two years is constant. In contrast, the implied probability of recession by end-2019 has risen from about 0.22 to 0.30 since 11/11. Is there any content in the probabilities imputed from PredictIt? Adjusted Rw-squared = 0.14. Bold figures denote significant at 10% msl. Spread in decimal form. This means that a one percentage point decrease in the spread results in a 6 percentage point increase in perceived probability of recession in the next year. 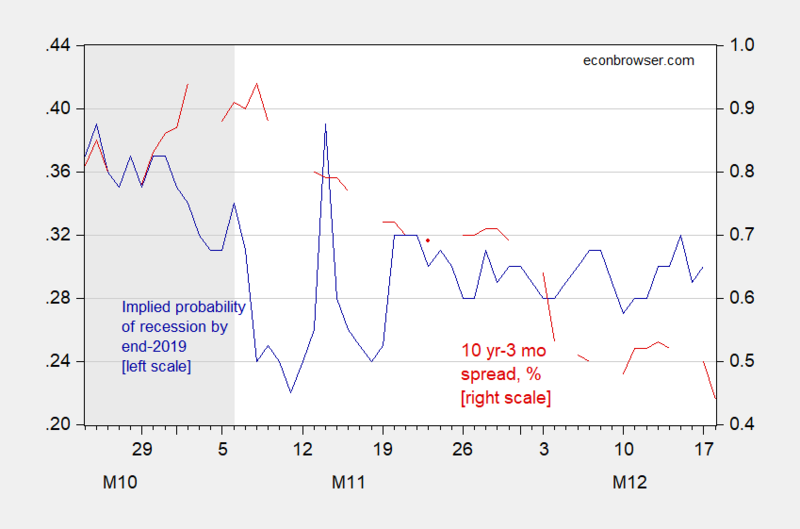 The current probability of recession using the term spread is in the 15% range, a bit less than the 30% or so from the prediction markets. This entry was posted on December 18, 2018 by Menzie Chinn. The man who co-authored a book in 1999 predicting the DOW would soon hit 36000 says no recession anytime soon? We’re doomed! Meanwhile Gary Cohen went on MSNBC and lied serially about the economy. My favorite was when he claimed real wages were growing by more than 1% per annum. I checked the most recent data on: (a) total compensation (up 2.8%); and (b) the consumer price index (up 2.2%). Of course Gary rounded (a) up to 3% and (b) down to 2%. Magic! When you compute your forecast model, are you using the average interest rates for the period or the end of period rates? In the past I seem to recall the ability to download end of month (EOM) rate data from FRED, but can’t currently find the EOM download data unless I were to use daily data. FRED has a drop down behind the “edit graph” button which allows end-of-period data choice. In fact, most any data series can be adjusted to lower frequency. Daily data, for instance, can usually be selected on a weekly basis for any day you want, Monday through Friday. I noticed that the daily data can be shown as monthly with an EOM choice, but have not seen the EOM on the monthly data choice. The monthly data default on the download seems to be an average of the data for the month. I think we need to look more closely at the prospects for a Non-US recession along the lines of 1998. I would be most appreciative if Jim or Menzie could provide some insight on China, Europe and othe major non-oecd. Jakelin Caal Maquin’s death deserves a “objective, thorough and independent investigation,” Enrique Moreno, a lawyer for Jakelin’s family, said at a news conference at Annunciation House in El Paso, Texas. “The investigation should not be the exclusive purview of the agencies whose actions and policies are being questioned, the investigator should not be the same entity as the investigated,” he said. Whatever an investigation may find, it will neither bring Jakelin back nor prevent a recurrence nor save any of the hundreds of otHers who will die this year. This is not an enforcement or accountability problem. It a problem of hopelessly and futilely trying to dam a river which can only be channeled. Leave it to you not to give a damn about holding CBP responsible. Any more pathetic comments in store for us from Princeton Steve? Lord! Notwithstanding, we calculate the odds of death in a crossing at 1 in 350. Holding BP accountable will not change that number. “If Border Patrol did something wrong, they should be held accountable.” They did do something wrong. Odd – someone posing as you the other day wanted to dismiss this. You should find this poser and have them not to post the garbage he does under your name. You should quote this poser. Will it raise interest rates 0.25% or not? I would have voted no. Did I hear correctly? They did raise rates by 0.25%. It appears that the stock market took a nose dive this afternoon. Was this due to the somewhat higher interest rates or these discussions of crosscurrents? I haven’t read that WSJ article yet, but most of Miss Brainard’s recent writings and statements I largely agree with. For the record, this market drop’s root cause has very little to do with interest rates. You don’t blame ex-post body temperature for someone getting the flu. Lael Brainard may be labeled many things. She has a PhD so she could bee “Dr.” She is married, so she could be “Mrs.” The obvioualy neutral and safe and politically correct word would be “Ms.” But you called her “Miss,” which is in fact outright incorrect as that implies not only that she is not married but never has been, and is now generally viewed as demeaning and politically incorrect. What is your problem, Moses? This is completely off the wall and bordering on sick. It may be fascinating for readers to note—the word “skewed” never appears in the research paper quoted by Barkley Rosser Junior himself, so much as ONCE. NOT EVEN ONCE. How many times does it need to be pointed out to you, Moses, that a “genome” is not a “population”? Oh, and for the record, I have regularly backed off of claims I have made when shown that I am wrnog. Consider recente exchanges with StevenKopits. I backed off my initial strong claim that July, 1990 was definitely a recession month. Looks to be a mixed bag with some indicators going down, some up, and some flat. And Sreven has backed oof some things on oil price history with me recently as well. Heck, regarding your sicko war on Warren, I hav granted several times that she made mishandled the situation. But you keep on insisiint on a variety of false claims from that she got her jobs at Penn and Harvard because of all this to the scientifically inaccurate one that a typical Europeaan-Ameirican would have more Native Indian ancestry than she has. And, again, for the umpteent time, a distrribution across a genome is not a distribution across a population. Youkeep repating ssomething that is not just wrong but absurdly so, making a complete fool of yourself with not a single person supporting you. You are the one who cannot admit he has made a mistke or bacck down from anything. “in the comments section” was the proviso, not arguing, just clarifying. I should have put that in italics or something to make it clear. This is the earliest of mine I could find looking just now. Though obviously (based on my past comment) I am certain I made one earlier than this. Not as early as 2015 though. So on that score, as on many scores I bow down to Menzie. (that is meant in a genuinely subjugating way as far as economics is concerned). Most likely it was very near to the date Miss Brainard was discussing how the rates picture had changed. Again, NOT as early as Menzie’s comments and terrific observations about the cerebral Miss Brainard. But I think 5 and 1/2 months should still give me one or two credit points. What are you trying to prove with your denigration of powerful and intelligent women? Are we to see youi using demeaning racial epithets for Michelle Obama and catty comments about Melania Trump’s clothing? What is your problem with all this? She. Lael is a woman. She absolutely would take offense at “Miss Brainard.” “Governor Brainard” is clearly the safe and preferred way to refer to her, as Menzie is doing. Thanks. Yes – prominent members of the FED can be women. My bad. At least I did not do a Trump and talk about her or Janet Yellin’s height! I’m so glad Menzie volunteered to read NewsMax so the rest of us don’t have to. Way to take one for the team. Our panel of judges has just certified this as a 5-star blog comment (no sarcasm there). We are also adding a special commendation for chuckle worthy content. If I am using the New York Fed staff recession forecasting model correctly, I find that the probability of recession within the next six months as of 12/18/2018 is about 28%. This is an increase from the probability of recession of about 13% as of the end of November 2018. The probit model uses the gap in the FRED categories, GS10 and TB3ms, the six month lag in the gap, and the twelve month percentage return in the S&P 500. I read somewhere that there was some progressive group that was going to go to Pelosi’s office either today or very soon and “demand” Ocasio-Cortez get an important committee seat. So, should be an interesting little subplot to follow this week. Is this because you have yet to retract your claim that Pelosi is “senile”? His repeated misogynistic posts are really off-putting. It doesn’t seem like a very inviting place to participate. That’s fair enough Sir. I certainly don’t want to step on your space, or impede on your ability to communicate here. I can still read Menzie’s thoughts from an RSS Reader. And most questions, if a person really wants to “dig in” they can find on their own. It’s been fun people. The rhubarbs and all. Extremely grateful to Menzie’s tolerance of me, over the months or whatever it has been. If I am reading this correctly, the indicator spiked significantly in September and doesn’t seem to match up very well with the information presented in your post. 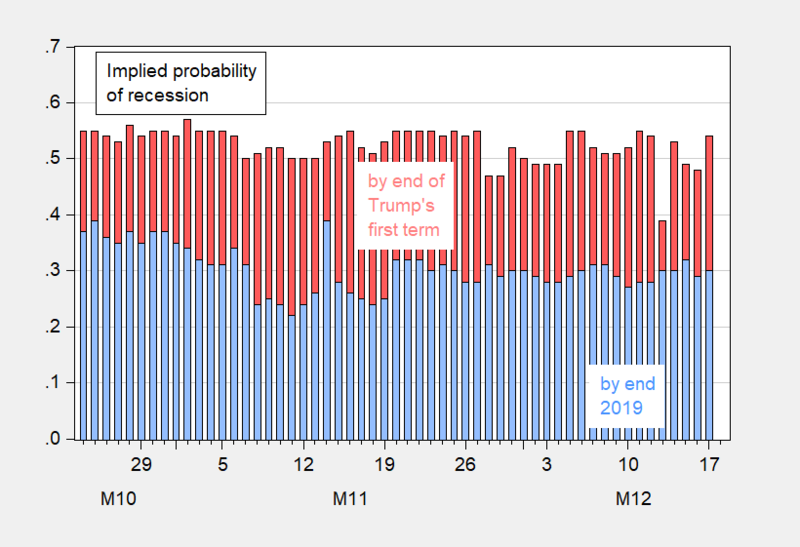 FRED is showing a .58 recession probability…your post suggests a probability of .15 based on the term spread and you reference the .30 probability I have seen elsewhere. Can you explain why the they might be so different? Is it the data input, the time frames? Have any of these proven more relevant over time? Are there other relevant sources of info? Following up on the FRED info I also found this discussion by Jeremy Piger from U of Oregon. https://pages.uoregon.edu/jpiger/us_recession_probs.htm/ I would appreciate any thoughts regarding his answers to Q2) “How should I interpret these probabilities as a recession signal?” and Q4 “Why is there a two-month lag in the reporting of recession probabilities?” . Note to regular posters: I don’t have a PhD in econ. I am not interested in political propaganda from the peanut gallery so if that is all you have to offer please don’t respond. I am asking because I want to understand this better. Thanks. Rob: I’m referring to a “nowcast”, which is an estimate of GDP growth in the current quarter. The probability of recession is exactly that — probability of being in a recession, in this case given four indicators and a Markov switching approach. There are other recession indicators; note my 0.15 is 15% probability of being in a recession in one year; the estimate you cited is 0.58% for September 2018. Hopefully that explains the distinctions. Professor Chin…thanks for the reply. I don’t have any confusion on the nowcasts. It is the recession probabilities that are throwing me off. Rob: Ah, sorry. Some recession probabilities pertain to latest reported quarter (Jim Hamilton’s based on advance GDP, reported on this blog), some pertain to latest available period (Piger, based on 4 monthly frequency series, as reported in St. Louis Fed), some pertain to in one year (those based on term spread, or term spread augmented by other macro/finance variables).